Here are some snazzy birthday facts about 29th of January 1964 that no one tells you about. Don’t wait a minute longer and jump in using the content links below. Average read time of 10 minutes. Enjoy! What day was my birthday Jan 29, 1964? January 29, 1964 was a Wednesday and it was the 29th day of the year 1964. It was the 5th Wednesday of that year. The next time you can reuse your old 1964 calendar will be in 2020. Both calendars will be exactly the same! This is assuming you are not interested in the dates for Easter and other irregular holidays that are based on a lunisolar calendar. There are 284 days left before your next birthday. You will be 56 years old when that day comes. There have been 20,170 days from the day you were born up to today. If you’ve been sleeping 8 hours daily since birth, then you have slept a total of 6,723 days or 18.41 years. You spent 33% of your life sleeping. Since night and day always follow each other, there were precisely 683 full moons after you were born up to this day. How many of them did you see? The next full moon that you can see will be on May 18 at 21:13:00 GMT – Saturday. Fun stat: Your first one billion seconds (1,000,000,000) happened sometime on October 7, 1995. If a dog named Moxy - a Miniature Pinscher breed, was born on the same date as you then it will be 240 dog years old today. A dog’s first human year is equal to 15 dog years. Dogs age differently depending on breed and size. When you reach the age of 6 Moxy will be 40 dog years old. From that point forward a small-sized dog like Moxy will age 4 dog years for every human year. Ukrainian–Soviet War: The Bolshevik Red Army, on its way to besiege Kiev, is met by a small group of military students at the Battle of Kruty. Alexandros Koryzis becomes Prime Minister of Greece upon the sudden death of his predecessor, dictator Ioannis Metaxas. In Bologna, Italy, the Anatomical theatre of the Archiginnasio is destroyed in an air-raid. The first direct commercial flights from mainland China (from Guangzhou) to Taiwan since 1949 arrived in Taipei. Shortly afterwards, a China Airlines flight lands in Beijing. A gunman kills a school bus driver and holds a 6-year-old boy hostage in an underground bunker in Midland City, Alabama. Malaysia has officially declared the disappearance of missing Malaysia Airlines flight MH370 an accident and its passengers and crew presumed dead. What does my birthday January 29, 1964 mean? Your birthday numbers 1, 29, and 1964 reveal that your Life Path number is 5. It represents progress, adventure and opportunity. You possess the curiosity of a cat and long to experience all of life. The following celebrities also have the same life path number: Frank Turner, Agnez Mo, Settimia Caccini, Daniel Cardoso, Dudley Moore, Michelle Yeoh, Mike De Leon, Adrianne Palicki, Thom Yorke, Lola Young, Baroness Young of Hornsey. 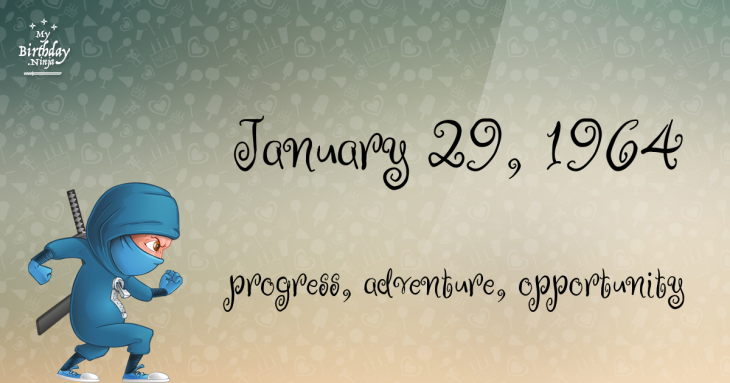 What is the birthday horoscope for Jan 29, 1964? The Western zodiac or sun sign of a person born on January 29 is Aquarius ♒ (The Water-bearer) – a fixed sign with Air as Western element. The ruling planet is Uranus – the planet of originality. According to the ancient art of Chinese astrology (or Eastern zodiac), Rabbit is the mythical animal and Water is the Eastern element of a person born on January 29, 1964. Fun fact: The birth flower for 29th January 1964 is Carnation for friendship. What is the Love Match for Jan 29, 1964? When it comes to love and relationship, you are most compatible with a person born on April 4, 1989. You have a Love Match compatibility score of +146. Imagine being in love with your soul mate. On the negative side, you are most incompatible with a person born on May 10, 1941. Your incompatibility score is -162. You’ll be like a cat and a dog on a love-hate relationship. Arf-arf, I want to bite you. Meow-meow, stay away from me! The number-one hit song in the U.S. at the day of your birth was I Want to Hold Your Hand by The Beatles as compiled by Billboard Hot 100 (February 1, 1964). Ask your parents if they know this popular song. How many babies were born on January 29, 1964? Base on the data published by the United Nations Population Division, an estimated 115,215,976 babies were born throughout the world in the year 1964. The estimated number of babies born on 29th January 1964 is 314,798. That’s equivalent to 219 babies every minute. Try to imagine if all of them are crying at the same time. What is the popular baby name on 29 Jan 1964? Here’s a quick list of all the fun birthday facts about January 29, 1964. Celebrities, famous birthdays, historical events, and past life were excluded. 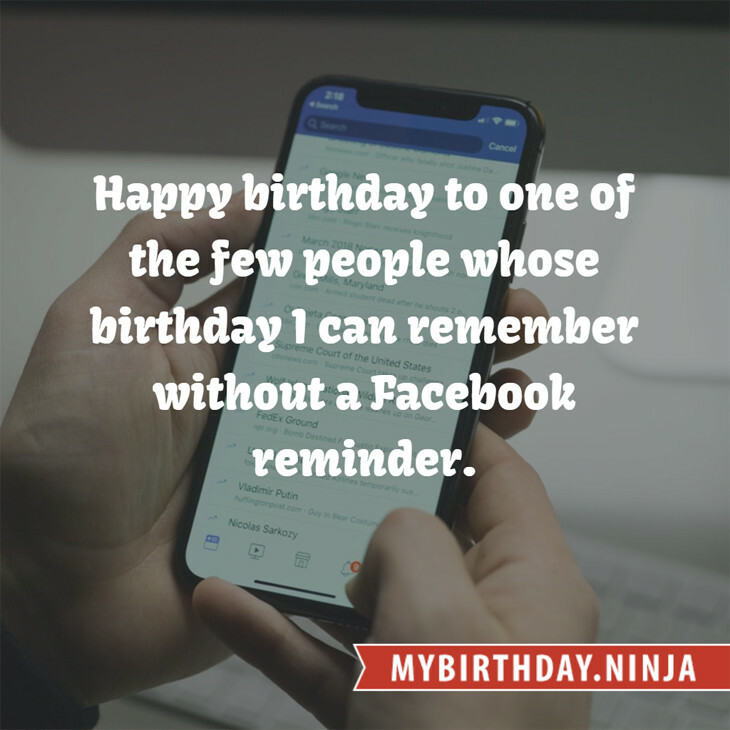 Try another birth date of someone you know or try the birthday of these celebrities: March 30, 1988 – Danica Thrall, English model; May 20, 1988 – Carla Humphries, American-Filipino model and actress; April 5, 1946 – Jane Asher, English actress.